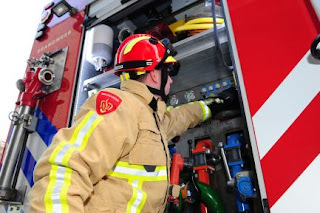 TenCate 16 December 2015: All the fire brigades in the Brabant-Zuidoost safety region – which also includes the city of Eindhoven – will now have the same firefighting uniform. Careful attention was given in the tender to functionalities such as ergonomics, comfort, personal protection and sustainability, in order to reach a single protective solution. The uniform from Sioen, based on TenCate Millenia™ fabric, was judged to be the best. Heat exhaustion Firefighters encounter a variety of risks. One of these is heat exhaustion, resulting from the build-up of heat in the suit while they are tackling a fire. Karin Klein Hesselink, end-use market manager at TenCate Protective Fabrics explains: ‘Regulation of heat in the suit is extremely important. The body must not become overheated and the clothing must properly wick away body heat and perspiration. Our TenCate Millenia™ system proved to be the best solution. This system is light in weight, strong, wear-resistant and it regulates moisture and heat extremely well. The patented 3D structure in the...read on.